Last weekend I installed Docker on my Windows 8.1 machine. The installation process was simple but as I went for testing it if everything is working fine, I encountered the following error. As I double clicked Boot2Docker Start shortcut icon on desktop it opened the following Unix shell only for a moment and disappeared without any alert or clue. Something was wrong somewhere - no idea what was that. The above screenshot indeed has the required clue for why the Boot2Docker shortcut was not working. 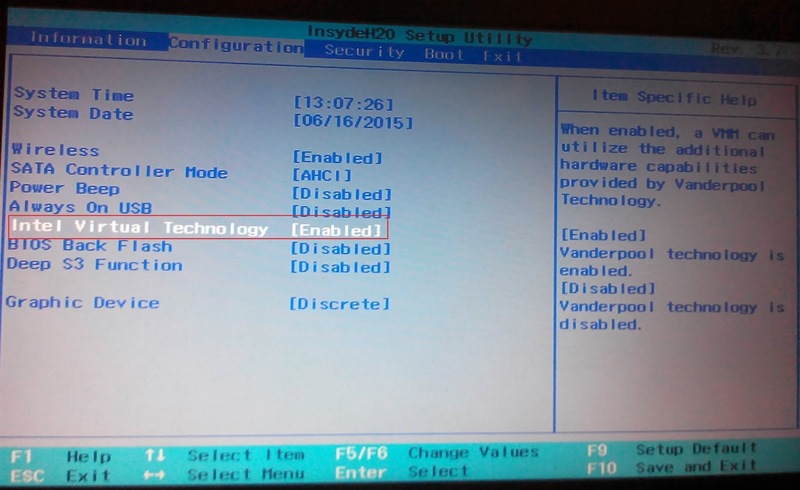 The virtual machine was not starting because virtual technology was NOT ENABLED in the BIOS. 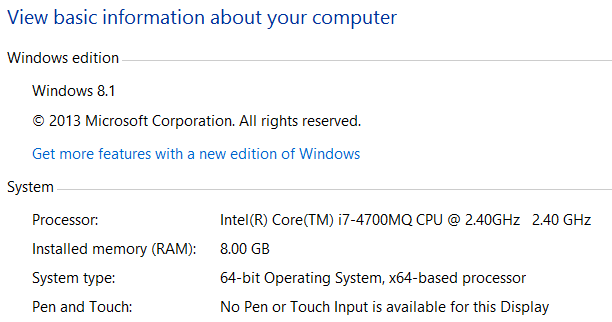 Note as per the Docker installation prerequisite - Docker has been tested on Windows 7.1 and 8; it may also run on older versions. Your processor needs to support hardware virtualization. 1. 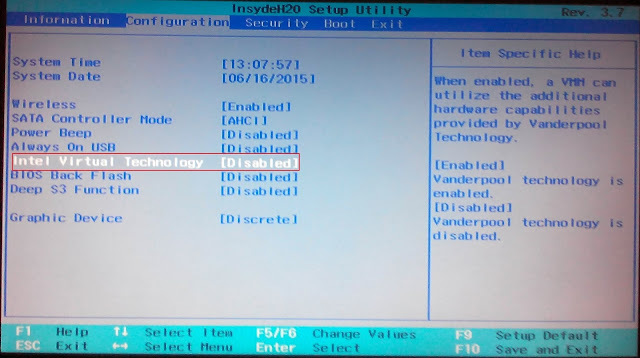 Enter in your machine BIOS settings. In my machine I found the virtual technology in Configuration section as seen in the following image inside the red colored rectangle. 2. Enable it by pressing F9 key. Press F10 to Save and Exit. 3. Reboot the machine and double click the Boot2Docker shortcut. Now it should successfully start the Docker Daemon and VM. The output was as expected, a perfect hello from docker as seen in the following image. Here's an important but optional info as far as this article is concerned. Here's another thread you may need to refer if your issue is still not fixed. Though you can write code even without understanding an iota of pointers but be informed that pointers empowers a developer in building an efficient system. "By giving the programmer control over basic memory layout, Go provides the ability to control the total size of a given collection of data structures, the number of allocations, and the memory access patterns, all of which are important for building systems that perform well." 3. Value assigned i.e. 101. In modern programming languages, a variable is allocated with memory only when it is necessary and is deallocated (i.e. the system automatically reclaims the memory) once it concludes that the variable is no longer in use by the program. For a variable, the period of time from its allocation until its deallocation is called its lifetime. What happens if a memory is allocated but not reclaimed? This may lead to a crash in some of the cases where a programs run for a longer time with large data sets. The specific program suffering with memory leaks can no longer fulfill allocation requests as the memory is already full. Modern languages (Java, C# & Go included) avoid memory leaks by implementing automatic garbage collection. The compiler allocates specific memory block (on the Stack in above case) in RAM for the variable i that holds the value 101. Do you know what is the size of that memory location? Will the size of the memory location change if we want to store 1234567890 in place of the existing 101 in variable i ? The size of the memory depends on the type of the variable (int in this case). So, it doesn't matter whether you're storing 1 in an int variable or a bigger value 1234567890, the size of the memory allocated is always 4 bytes. Run this code here to see this theory into action. P.S. In case of C language, the size of memory blocks of same type may vary based on the machine configuration. In Go - How do You Know Whether a Variable is Allocated on the Heap or the Stack? As per the Go Official FAQs you don't need to know this. The compiler will decide this for you. Also, it is important to note that, for garbage collection, the current implementation approach of the Go is a parallel mark-and-sweep collector (may change in future). 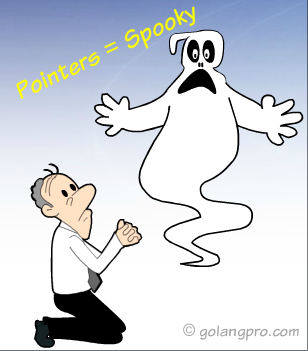 Pointers allow different sections of code to share information easily. You can get the same effect by copying information back and forth, but performance is far better in case of pointers. Pointers enable complex "linked" data structures like linked lists and binary trees. 1. Send a copy of the video to him via file transfer sites. 2. Upload the video to Dropbox and share a link of that video. The second option is more efficient than the first one because if needed, you can share the same link to multiple contacts. This is same as sharing information via pointers - as they have the address of the location where the actual value is stored. With reference to the above image, what is the output of the following code? It prints 101 (and NOT the hexadecimal address). This is known as dereferencing or indirecting. -- In Go, if a variable is not assigned it is automatically initialized with a default value. - empty strings "" in case of Strings and so on. -- Pointer doesn't store the actual value. They store the reference. 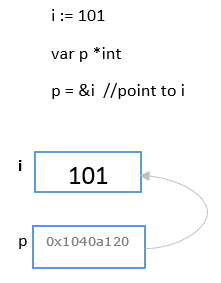 -- The symbol * is used to derefrence pointer variable i.e. to get the actual value. -- The operator & is used to find the address of a variable. -- Pointer to a constant or literal value will give you compiler error. Check this code to verify. How can I improve this post? Please share your views in the comment section.